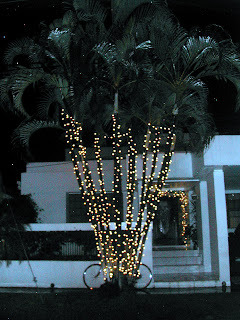 Christmas traditions in La Ceiba aren't so different from those in the U.S., depending, of course, on the income level of the family. The traditions here in La Ceiba may have been influenced by the long-time presence of the Standard Fruit Company (Dole Co.), at one time the largest employer in the area. Christmas is very commercialized here, too. Right now the newspapers are full of ads for clothes, appliances, computers, and cellphones. The stores are full of trees, lights, decorations, and Santa Clauses. Children almost always receive a new set of clothes and shoes for Christmas. Often that is all that the family can afford and for some it may be their only pair of shoes. I know some very poor families and I can tell you that those kids are as happy and proud to receive a new outfit as many North American kids may be to receive thousands of dollars of gifts. Dolls for girls and toy cars for boys are common presents and the quantity (and price) of presents increases with the wealth of the families, just like in the U.S. The children's padrinos (godparents) sometimes give gifts to their godchildren. El Jefe's family was very poor. One year his three brothers received toy cars from their godfather. His godfather didn't give him anything so he sat around watching his brothers play with their new toys while he had nothing. Another year, they all got up on Christmas morning to find no presents at all. El Jefe's mother told them that Santa Claus forgot their house that year. Sad, no? He doesn't ask for sympathy because being poor was just a fact of life to him. It made me very sad to hear it, though. It also makes me sad to think how parents must feel when they can't provide a gift to their children. 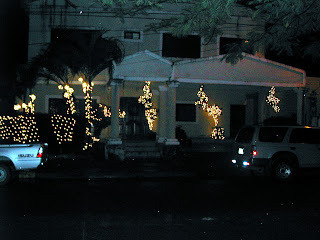 Many churches have Christmas Eve or Christmas night services. Although Honduras is routinely reported as being 97% Catholic, my guess is that in La Ceiba that percentage is closer to 50%. There are many Evangelical churches, as well as a big Mormon church and other informal Christian churches as a result of the missionaries who come here. Las posadas is a tradition in which relatives all go to spend the night with one family on Christmas Eve or sometimes for several days. At midnight, everyone goes outside and hugs each other and thanks God for surviving another year. Some pass the night at their church. 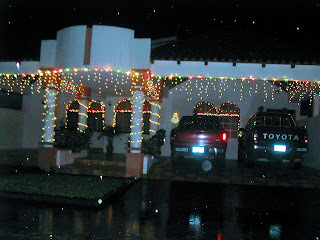 Wealthier families often spend Christmas time at their country or beach house. Christmas is not Christmas without tamales. For those who do not make their own, many women sell tamales at Christmas time, taking orders from friends and neighbors. They are often shared with neighbors or relatives as a gift in the way that those in the U.S. often exchange cookies or other treats at this time of year. Tamales are filled usually with a small chicken piece (including the skin and bones) or sometimes pork and some combination of rice, potatoes, garbanzos, peas, and green olives. Tamales are wrapped in banana leaves instead of corn husks. Some eat their tamales with ketchup. Arroz con pollo (rice with chicken) is a popular celebration meal, as is a similar dish that includes bits of other meats and is called Chop Suey − El Jefe frowns on this practice. Whatever is served absolutely must be accompanied with tamales. No exceptions. Sandwiches (usually chicken on sliced white bread with mayonnaise, ketchup, and mustard) are another popular food this time of year. Cake is often served to guests, as is rompopo (eggnog). Red grapes and apples are traditional at Christmas time; the groceries and markets are full of them, including some of the biggest grapes I've seen in my life. Frozen turkeys, canned cranberry sauce, and pumpkin pie filling are readily available in the grocery stores in La Ceiba. At a price, though! Cranberry sauce is being advertised right now for $1.59 per can (regular price $2.55) and I have paid as much as $40 for a medium-sized turkey, putting it well out of reach for most families. 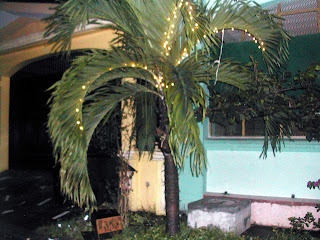 As shown in the pictures, many houses and palm trees are decorated with lights. Most decorations are behind the tall walls as it is likely that anything placed outside the walls would be stolen. 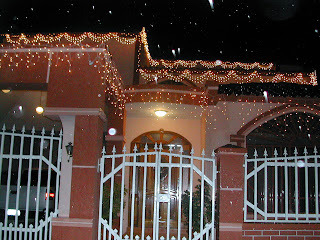 By the way, in two of pictures, it looks as if it is snowing − nope. Those are raindrops. 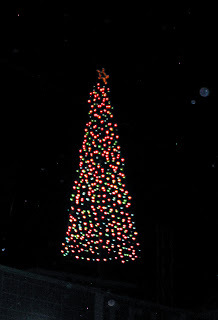 Middle or upper income families are likely to have an artificial Christmas tree. 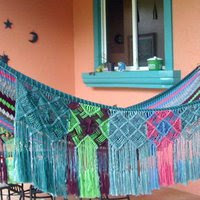 Pine trees are not grown nearby although they are grown in Honduras for wood. An odd (to me) tradition is house painting. 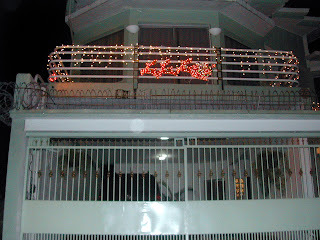 Many people paint their house at Christmas, some do it almost every year. 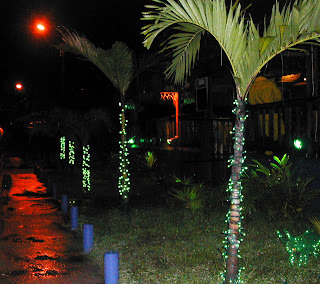 It's odd to me because this time is right in the middle of La Ceiba's rainy season − not the best time to paint, so that may be why it has to be done so frequently. Now for the Christmas traditions that I really dislike: Guns and fireworks all night long, especially at midnight on Christmas Eve and New Year's Eve, but continuing until almost daylight. Various cities and towns ban the fireworks each year but it doesn't seem to have much effect on the quantity available. Even small children can buy them at the corner pulperías (small grocery stores). Although we are still two weeks from Christmas, six children have already been hospitalized for burns from cohetes (firecrackers). The guns are shot up in the air but what goes up, must come down. My neighbor told me that one year, his father got out of bed during the night. When he came back to bed, he found a bullet hole in his bed. A bullet had come through the roof and gone through his mattress right where he had been laying. In addition to guns and fireworks, music so loud that you can't talk to one another is common in homes and businesses. Just walking down the street can be painful to your ears. 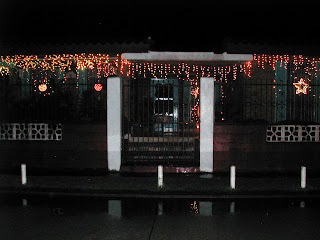 Other parts of Honduras may have different Christmas traditions. Maybe some of our Honduran readers will comment about them? 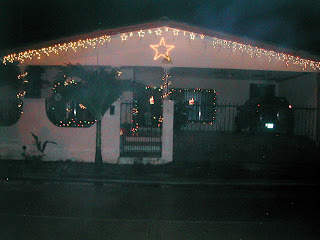 All in all, except for the noise, Christmas isn't so different in La Ceiba than it is in the U.S.
Has La Gringa overlooked her tortilla payment?